A comprehensive lifetime preparation course that is a place for participants to learn how to sail. Designed for both students who have no sailing experience and for those who have experience, but want to be sure they learn to sail the right way, from the ground up. Our philosophy is “get as much hands-on learning” as possible and we focus on practical training. You won’t find yourself sitting in front of a blackboard for our classes! Become the confident sailor you’ve always wanted to be! OBJECTIVE: This course is designed to teach the basic skills and knowledge required to helm and/or crew on a sailboat of up to 30 feet in length. Upon completion of the course, participants will be able to sail safely and efficiently, under sail or power, in moderate wind and sea conditions. * Quelques uns de ces cours sont aussi offerts en français. Communiquez avec nous pour obtenir plus de détails. OPTIONS: Weekends, Weekday Daytime, Weekday Evenings, and Live-Aboard. Ottawa: $745.00 + HST View Schedule (28 Hour Format; offered in Ottawa and Kingston). Kingston: $1199.00 + HST View Schedule (* Provisioning not included; Live-Aboard offered only in Kingston). CERTIFICATION AWARDED: Sail Canada Basic Cruising (Skipper) Standard or Sail Canada Basic Cruising (Crew) Standard & Pleasure Craft Operators Certification. Review the course schedule to find a class that suits your needs. Register by adding your course choice to your shopping cart and proceeding to the checkout or calling the office at 613-721-8683. Take the on water course. Complete your certification by taking the final exam. 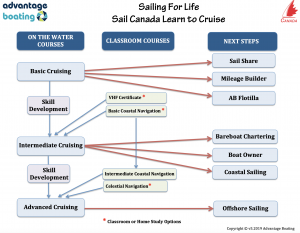 Next steps once you’ve completed your Basic Cruising (Skipper) certification.